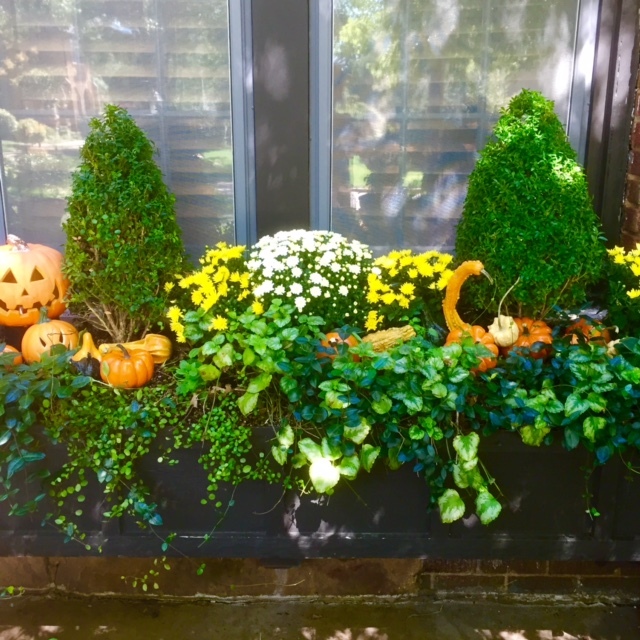 A bright, early fall example of how to style a window box with greenery, seasonal flowers and fruits of the season: gourds, pumpkins and jack-o-lanterns. In our highly fractured political climate, it is hard to get Americans to agree on anything. 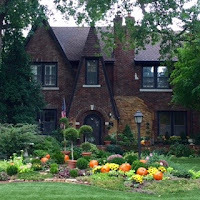 But I feel fairly certain, that given a vote or taken a poll, we would get close to 100% consensus that window boxes are a charming way to add greenery, softness and seasonal flair to one's home and outdoor spaces. I wrote an article for SOUTHERN LIVING Magazine (here) not too long ago about the hows and whys and wheres for building, planting and maintaining a stylish little window box garden. 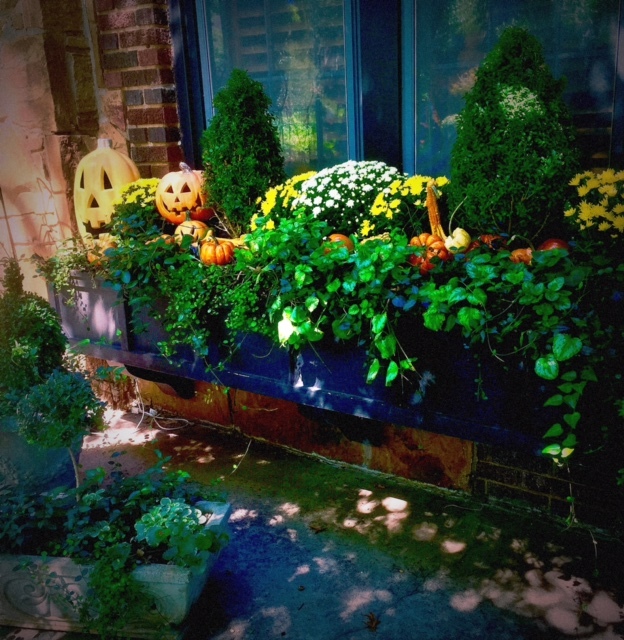 You can read the article Thinking Outside the Window Box (here) and also get a glimpse of the way I had mine styled for fall a few years back. 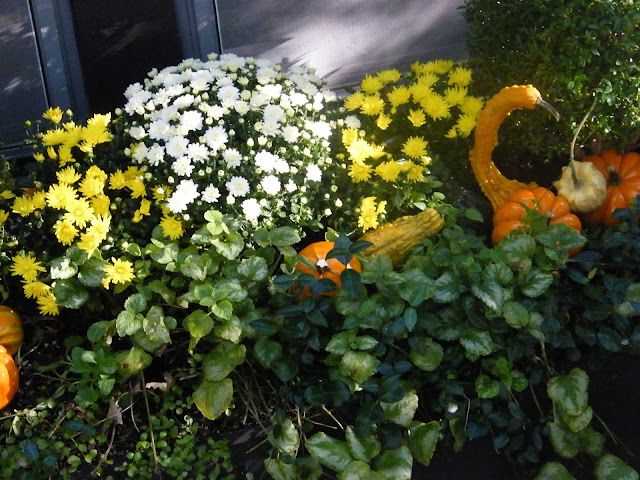 This year, I am all about traditional autumn plantings and colors, hence my 2016 version with classic mums, pumpkins and gourds. 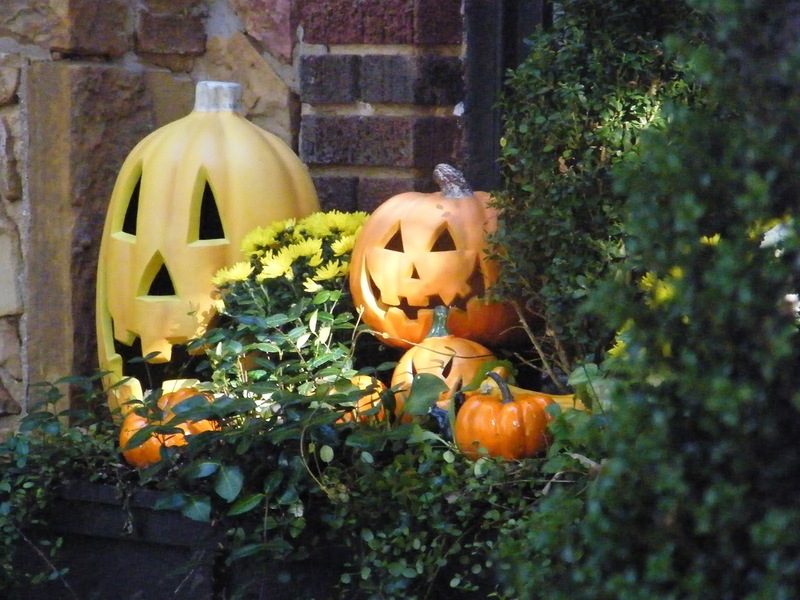 With a plugin jack-o-lantern or two for added pop and in deference to that quintessentially American holiday, Halloween. 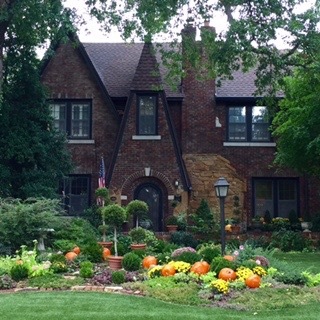 A straight on view of the window box, clearly showing the layers of plantings...thrillers, fillers, and spillers...topped off with decorative gourds and pumpkins. But I digress, back to planting and styling the window box. Remember that most of the time, your window box will be seen up close at an angle from either side as visitors and family enter and exit your home. This long angled view, in my opinion, is far more engaging than the straight on perspective. In terms of the contents, I employ the classic thriller, filler, spiller container formula. Aka, plants to add drama and vertical interest, plants to fill out the composition and add color, and trailers to spill out and cascade over the edge, adding texture, romance and softness to the composition. PROVEN WINNERS has a good description and example of this container design technique here. Ideally, I like my window box thriller(s) to be evergreen, to provide year round interest and prevent planting them repeatedly year after year. But generally, in my situation anyway, they normally last a year or two max because of a change in the light and southern exposure ....as weather events are constantly messing with my trees to change my box's cultural environment and its demands from one season to the next. Bright mums whose colors can be seen from a distance, along with shiny gourds, catch the light and add to the magic. 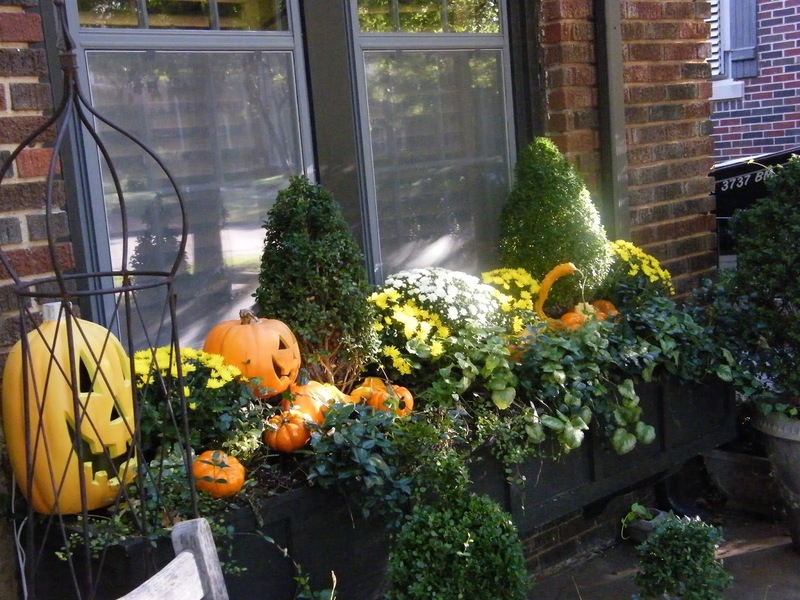 Three plug in jack-o-lanterns add to the allure of this small window box garden. 2 Boxwood Cones + five 6" Mums + (about 16 total) 2" Ivy, Wire Vine and Lamium. Sprinkle with cheery pumpkins, gourds and varied colored squashes to taste. 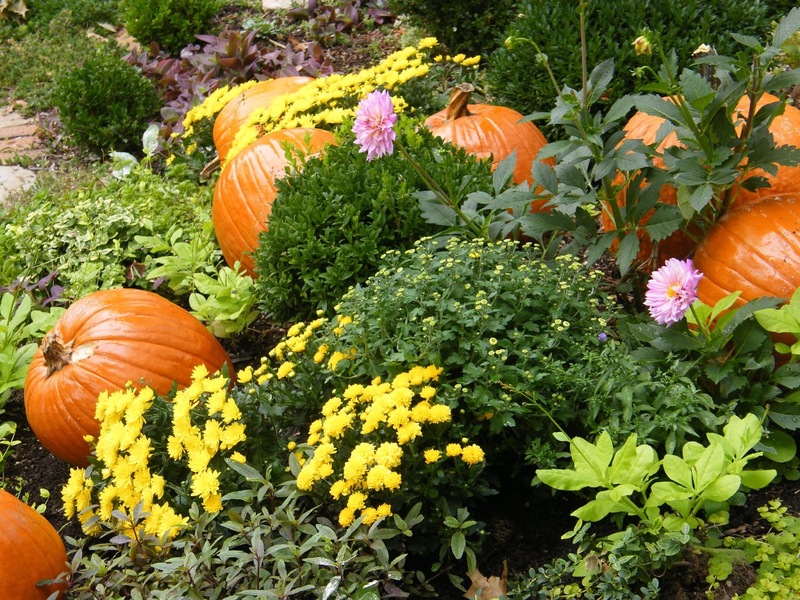 Generous mounds of like colored pumpkins, gourds and mums are added to from landscape. 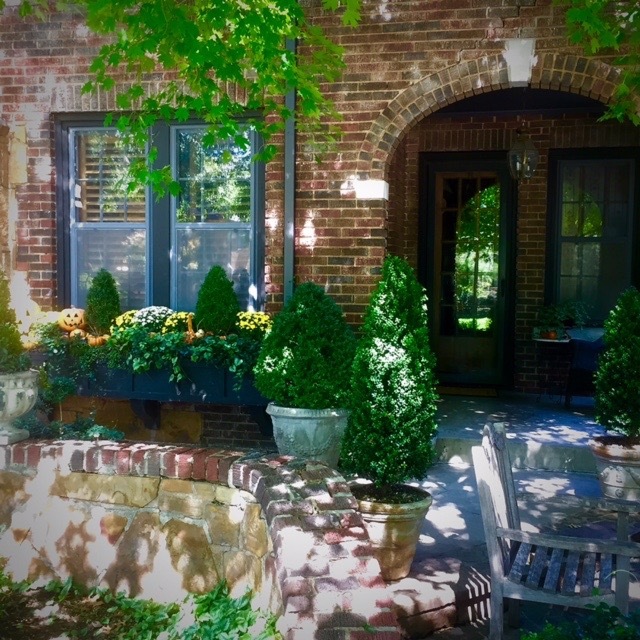 Large boxwood in concrete pots accompany the window box and add to the lush effect. 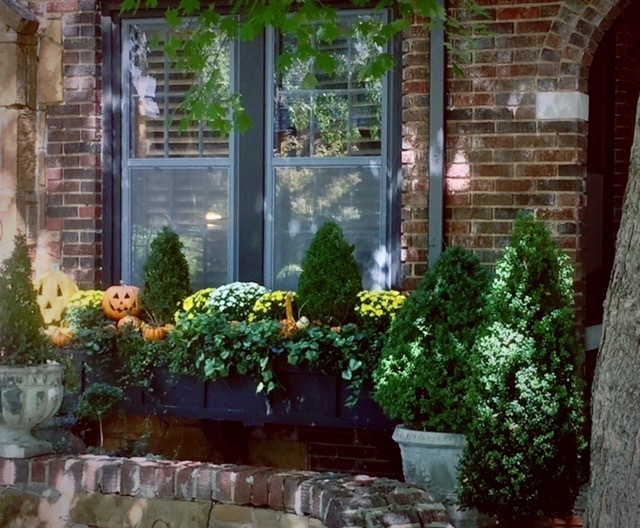 The window box and porch decor hopefully say WELCOME! an artfully, lovingly styled window box.